Over the past six weeks the California primary conducted on Tuesday has been the subject of two RTE posts & for good reason – California has long been a trendsetter for the rest of the country & the recent trend has not been good. The two posts highlighted the things that are happening in California to turn the state around & the first was to get a bonafide libertarian candidate for governor on the ballot in November who could win so that he could lead the needed return to excellence in the Golden State. Mr. Cox will continue to campaign on reversing the socialist policies that Democrats in office have put in place that have plagued California for years – policies supported by his opponent former San Francisco Mayor & current Lieutenant Governor Gavin Newsome. Mr. Newsome promises more of the same if not much more of the same. Specifically California has the highest marginal state income tax rate (13.3%) in the country, the highest state sales tax rate (7.25% but varies by district with 9.5% in LA), sky-high gasoline taxes including a recently passed $52 billion gasoline tax increase, car registration fees, traffic fines, high utility rates, & high crime rates & large homeless encampments in many areas. The state ranks dead last in friendliness to business, has the highest poverty rate in the country, a growing unfunded public pension liability that has reached a critical stage, & a huge public retiree healthcare liability that has not even begun to be funded – all of which hurts the middle class. But most despicably California has not only declared itself a "Sanctuary State", along with Illinois, Colorado, Massachusetts, New Mexico, Oregon, & Vermont but has mandated & expanded protections for undocumented immigrants including actually prohibiting state & local police agencies from notifying U.S. Immigration & Customs Enforcement (ICE) officials when illegal immigrants in their custody, who may be subject to deportation, are about to be released. California has instructed its counties, cities, & businesses to follow suit providing sanctuary for illegal immigrants or face criminal charges meaning that California will fine businesses &/or imprison people who cooperate with federal immigration law & the Constitution. But a still growing number of cities & counties have been pushing back against California's sanctuary policies & on Tuesday they found the best way, namely through the leadership of John Cox as Governor, to end the state's aforementioned terror tactics. California is on the precipice of becoming the microcosm of America in a very negative way. In November the citizens of California, along with the illegal aliens who vote, will decide if California will continue on the ruinous socialist path it has been on under Newsome's participation & involvement as Jerry Brown's Lieutenant Governor as described above or be turned around by electing John Cox Governor of California. The people of California have a real chance to reverse, both financially & culturally, the terrible manner, way, & mode of life described above - lousy conditions that no one in their right mind would want to live under where the state government fights the federal government using American citizens as disposable pawns @ every turn while favoring illegal aliens wherever they find them. But electing Mr. Cox Governor of California won't be easy. WSJ Editorial Board Member Allysia Finley responded to my inquiry to her regarding Cox's chances – "But the rub is that Democrats make up 44% of registered voters while Republicans are just 25%. Independents are about 25% but they generally lean left in California. 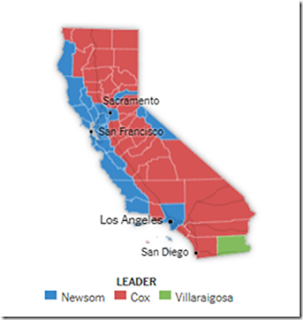 Newsom would lock up nearly all of the Democratic support while Cox would win most Republican voters. 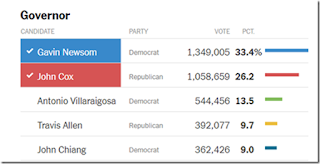 Villaraigosa's (refers to former Democrat Mayor of LA Antonio Villaraigosa who finished 3rd) core support is Hispanics and blue collar Democrats. Hispanics are more likely to vote for Newsom while blue collar Democrats would likely stay home. Neither group is likely to vote for Cox." My analysis that Ms. Finley so graciously responded to was based on Cox picking up much of Villaraigosa's large charter school supporters (Villaraigosa had supported charter schools & confronted teachers unions by supporting a lawsuit to over turn the state's teacher tenure & seniority laws when he was LA Mayor) & virtually all of the other Republican votes cast in the primary – there were a total of 27 candidates – Michael Reagan said that his ballot had one & a half pages of candidates names for governor. But no state leader has endorsed Cox. Senator Kamala Harris (a presumed 2020 presidential candidate) is campaigning with Newsom. Teachers unions are backing Newsome. Charter school proponents backed Villaraigosa & upon finishing 3rd in the primary Villaraigosa immediately endorsed Newsome. But to top it off Meg Whitman, former Republican gubernatorial candidate eight years ago, endorsed Villaraigosa before the primary. So where is the Republican Party in California? It was demoted to third party status after the California Secretary of State reported that 44.4% of registered voters were Democrats, 25.1% were registered Republicans, & people replying "No party preference" was @ 25.5%. The Republican Party in California can only be found in Trump & his endorsement of Cox. There is no money coming in from the Republican National Committee because of the above stats, demographics, & the expensive media market. California's electoral map from Tuesday's primary resembles that of the U.S. in recent years in that Democrat support is on the coast & a few isolated counties. See below. Cox's presence on the ballot can only help Republican turnout in November which will help Republican congressmen hold on to their seats – as all of them, plus those in NJ & NY have been targeted. Two Democrats @ the top of the California ballot would reduce Republican turnout affecting down ballot elections. But that is another matter & this post is about showing the high stakes of the November election for California & ultimately America & the importance of changing California's negative influence on the rest of the country. Voters in California will show what they consider to be their own best interest. Are the Villaraigosa voters interested in following through regarding the benefits they see for their children in attending charter schools thereby giving them a much better chance of not leading a life of hopelessness due to poor education or do they say I am such & such a minority & there is my allegiance - supporting some minority candidate's endorsement of Newsome whose bread is buttered by the Teachers Unions? In order to have any chance Cox has to reach these Villaraigosa primary voters & then some. As a long shot exacta player I am concentrating on the fact that Trump received 4,483,810 votes for president in 2016. Jerry Brown received 4,388,368 votes for governor in 2014 so there are enough people in California for Cox to win if he can motivate them to believe that the stakes are high enough which they are. Long time readers of RTE will recall the many posts written about Detroit as a microcosm of America. California fits that description as well – but as a state not just a city so the stakes are even higher. From the August 12, 2013 post - At one time Detroit was America's wealthiest city by per capita income & fourth largest by population – then its manufacturing base collapsed. Today Detroit is the city with America's lowest median income ($25,000), it has lost over 60% from its peak population, over half the children in the city live in poverty, just under half the residents are functionally illiterate, & the unemployment rate is 18%. One third of Detroit's 140 square miles is a wasteland – forlorn, forsaken, vacant, &/or deserted. The decreasing population abandoned over 33,000 homes. There are now 91,000 vacant lots. In some areas houses on entire blocks have been razed. Some neighborhoods have ceased to exist & as they disappeared so did all traces of human life. a city without a major chain grocery store. The median house price is little more than pocket change compared to housing prices in other areas of the country. The city has put in place all of the statist's dream government-dependent programs from establishing a living wage that exceeds the federal minimum wage to supporting teachers' unions with very high per student spending that still produces extremely poor results (in 2008 there was less than a 25% high school graduation rate & in 2013 less than 20% of graduates were considered ready for college). Detroit has borrowed to meet its operating costs & pension & healthcare insurance liabilities & as such retirees face an uncertain future. The city's homicide rate is @ a 40 year high & it has been on the most dangerous cities in America list for over 20 years. The above description of Detroit is the kind of deterioration that California can avoid under the governorship of John Cox who is first & foremost a successful businessman & CPA who built his own business from scratch to a $200 million company with approximately 100 employees – just about my most desirable qualification & first requirement to be able to run for president let alone governor. If California doesn't learn from Detroit's collapse, they will be next. We truly need to pray for California and Tuesday's election!!!! Love that Hiroshima and Detroit analogy. Hope the Republicans are out knocking on doors because there is big money against them! It is hard to understand how the voters of California want to again elect a progressive state official, the governor, this Fall, after all they live the conditions that RTE listed in California - highest state taxes, homelessness, defiance of the immigration laws, the anti-business atmosphere, etc. I agree with RTE, there is hope when you consider that President Trump had a bit more California votes in 2016 than outgoing Gov. Brown had in 2014 when he won reelection. John Cox has to ring a lot of doorbells to win in November. High Tax States Again Lead Out-Migration In U.S.